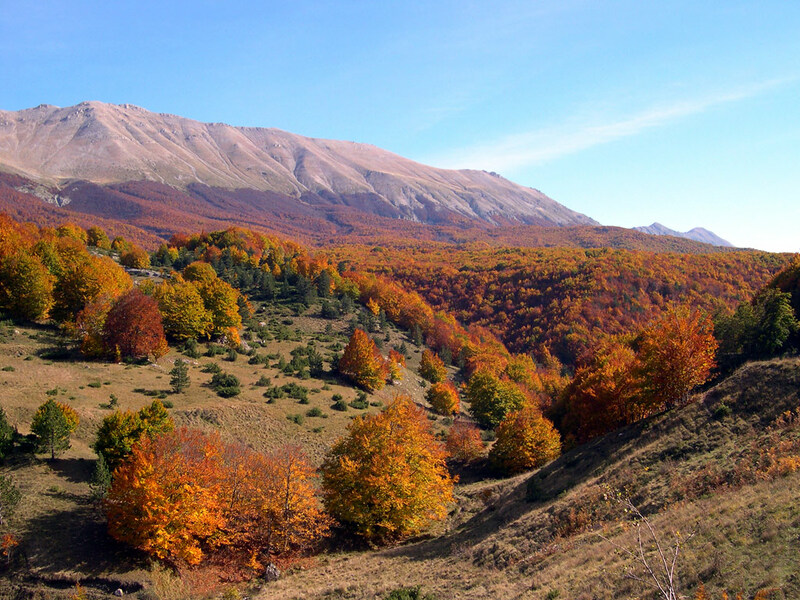 At just a short distance from Rome, the Abruzzo is one of the most interesting areas in Italy, featuring some amazing mountain scenery, not as famous as the Dolomites further north, but with a nature so precious that the region now even boasts three main national parks and a number of regional parks. You’ll find some pieces of almost pristine landscape, where even wolves, deer and brown bears still wander around. The nature here is overwhelming and well protected. 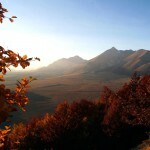 During this tour you’ll visit all three national parks, each very different from the other, but all equally beautiful. You will of course make some wonderful walks through all of this abundant nature, which makes you feel like you’re far away from everything else. 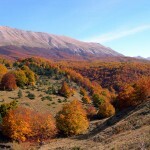 You visit some of Italy’s most beautiful national parks, among which is the Gran Sasso National Park – featuring the highest peak in the Apennines – the savage Maiella National Park, dotted with remote medieval monasteries, some of which were founded by the famous Pope Celestine V, and of course the Abruzzo National Park, one of the oldest protected landscapes in Italy. 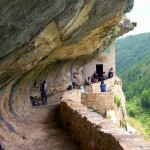 But nature is not the only feature of this area, and we don’t forget about the cultural treasures of this region either. You will walk through medieval villages scattered around the local hilltops, and past monasteries with beautiful frescos, as well as some of the beautiful little towns in this region. 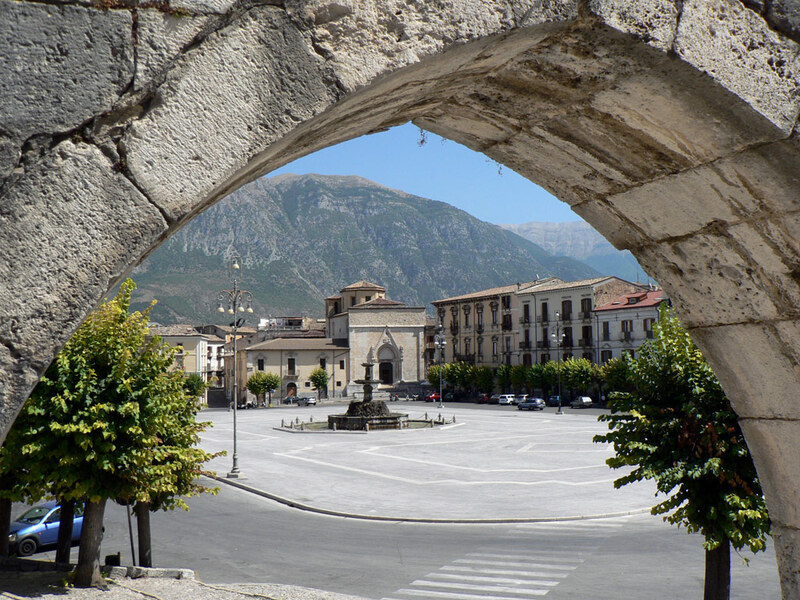 You spend some time in wonderful Sulmona – birthplace of the Roman writer Ovid and one of the most famous popes, Celestine V, mentioned in Dante’s Divine Comedy – in amazing Scanno, favourite spot of the photographer Henri Cartier-Bresson, in the beautifully restored Santo Stefano, and in Pacentro, with its wonderful castle. 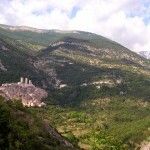 This journey takes you past abandoned castles on remote mountain peaks and amazing churches in the middle of nowhere. 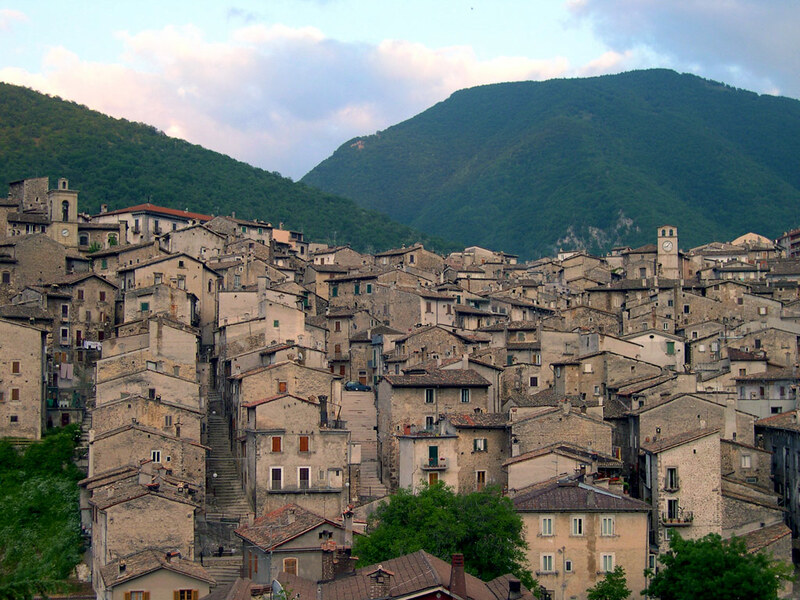 From Rome, the ‘Eternal City’, a great metropolis where thousands of years of history can be found on every corner, we journey inland into the wild mountainous area of the Abruzzo. 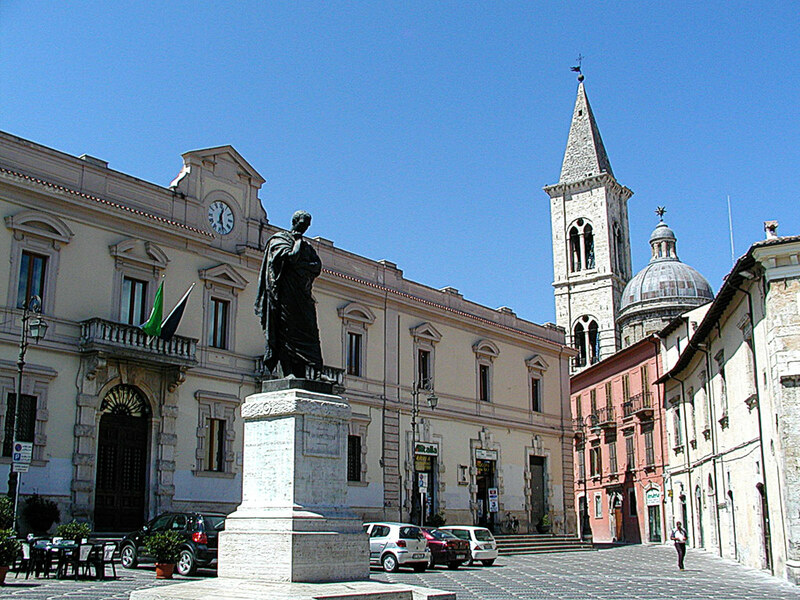 First you travel to the wonderful city of Sulmona, an ancient Roman city, and privileged residence of many popes. 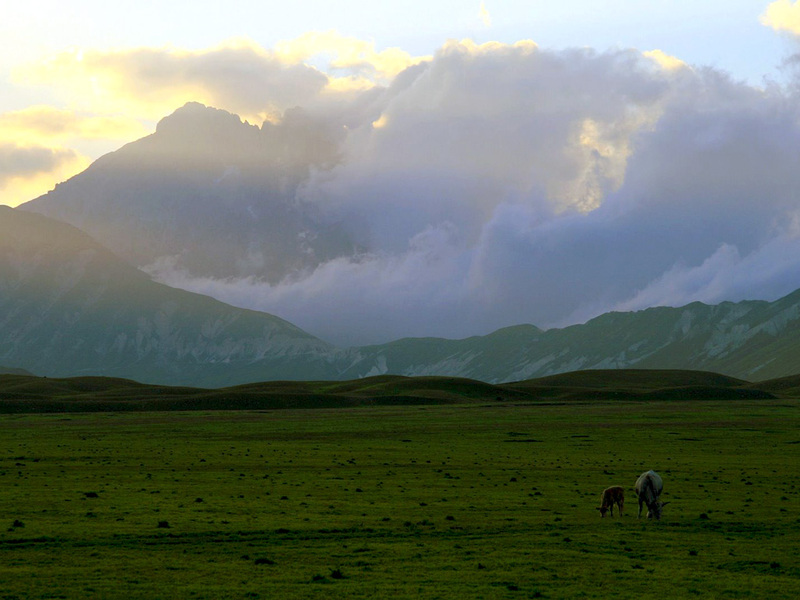 From here you visit the first of the three national parks, the savage Maiella National Park, with its amazing mountains and beautiful canyons, dotted with remote medieval monasteries. 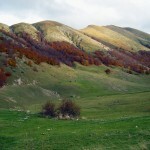 Then you travel to the Gran Sasso Park, with the highest peak in the Apennines earning it its title: the ‘Big Stone’. 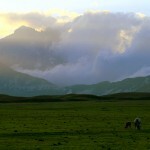 A great roundwalk here, starting from the amazing Campo Imperatore, makes you think you’re somewhere in the Himalayas. During the final few days you’ll travel to the southern part of the region. 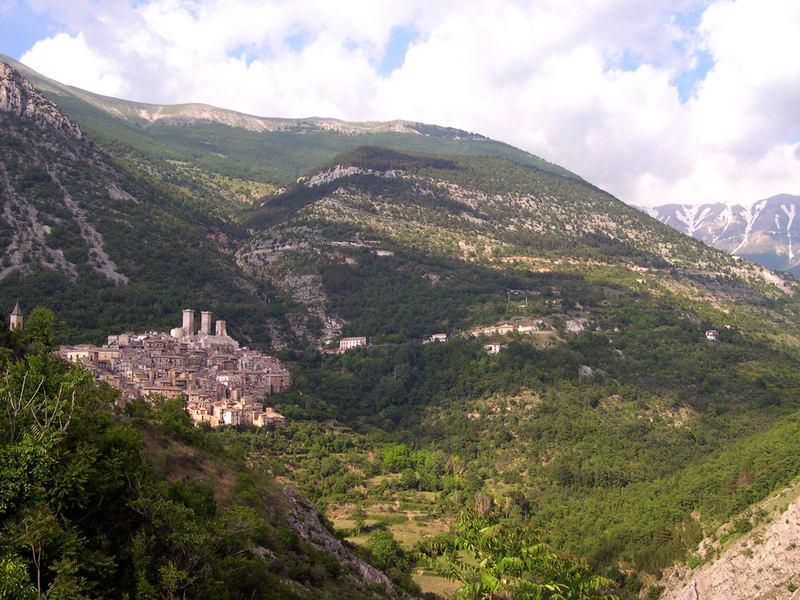 First through the amazing Sagittario canyon to the beautiful old village of Scanno, then on to the Abruzzo National Park, one of the oldest protected landscapes in Italy. Here you might encounter deer, and, if you’re really lucky, even a wolf or brown bear. Some relaxed walks through nature and a last great meal looking out over the great lake of Barrea are a worthy end to this trip. 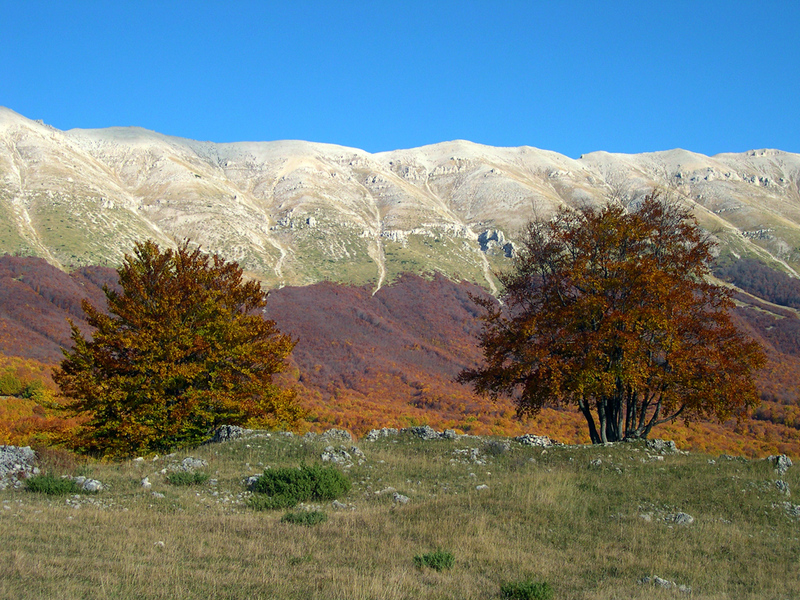 The Abruzzo area, yet to be discovered by mass tourism, presents its authentic character to the traveller, who is still treated like a guest. The premises where you’ll be staying are all small, genuine, family-run hotels. The tour standard is 3/4 stars. You start the tour from Rome. 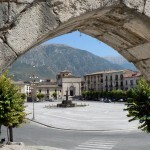 You meet here in the early afternoon and then travel by private bus to the beautiful city of Sulmona – birthplace of the Roman writer Ovid and one of the most famous popes, Celestine V, mentioned by Dante in his Divine Comedy – yet virtually undiscovered by mass tourism, despite its many cultural treasures. Your hotel is in the heart of the city. You eat together in a nice local restaurant in the medieval centre and then have time for a stroll and perhaps a ‘gelato’. 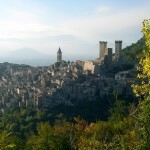 This morning, after breakfast, you make a short scenic ride up to Pacentro, a very scenic medieval village on the edge of the mountain chain, dominated by the impressive towers of its medieval castle. You arrive at the higher part of the village, and you can therefore walk through the whole historic village centre downhill and perhaps have a coffee in the square. 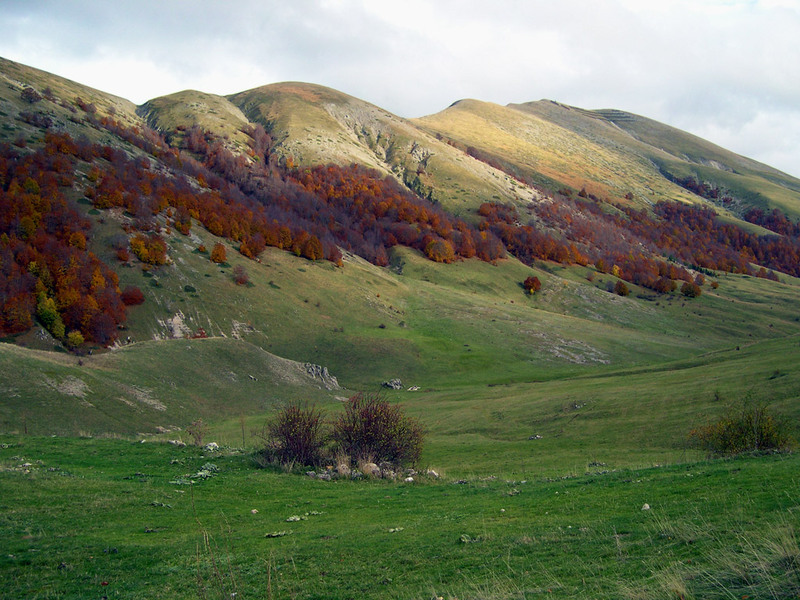 Then you continue your walk into the Maiella National Park, one of the last remaining bits of real wilderness in central Italy. 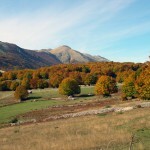 You are driven into the Orta valley, which separates the two main ridges of the Maiella National Park. 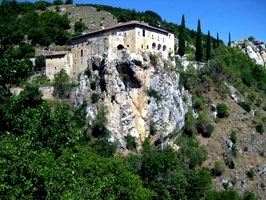 Your minibus takes you to Passo San Leonardo, where you start the walk to Rocca Caramanico, a small hamlet dominating the valley from its lonesome rock high above. 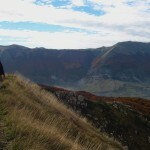 The walk brings you along the edge of the mountain range, a scenic walk, without much climbing. After a relaxed walk you arrive at Rocca Caramanico, where you can stop for a drink, or even have something to eat at the restaurant. Then you start the descent all the way down into the valley, where you walk to Caramanico Terme, your base for the next two nights. 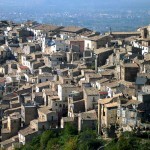 You could also opt to relax, have a drink and board a private bus to Caramanico instead. In the evening you have dinner in a nice restaurant near the hotel, which serves some good local cuisine. Total walking time: around 4,5 hours (approx. walking distance: 9,5 km). Total driving time today is around 1 hour. 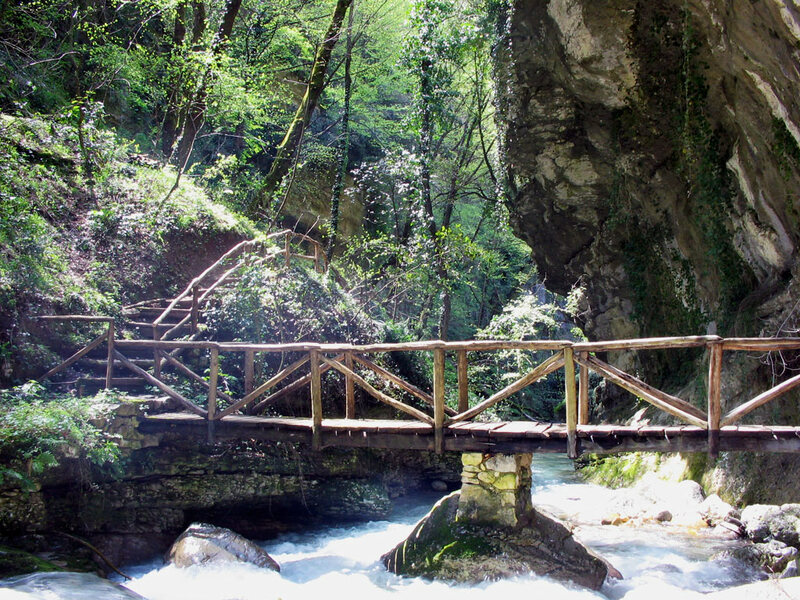 Today will be dedicated to the wonderful nature of the Maiella National Park, discovering the area’s biggest ‘canyon’, that of the River Orfento. The walking day begins straight from the hotel door. 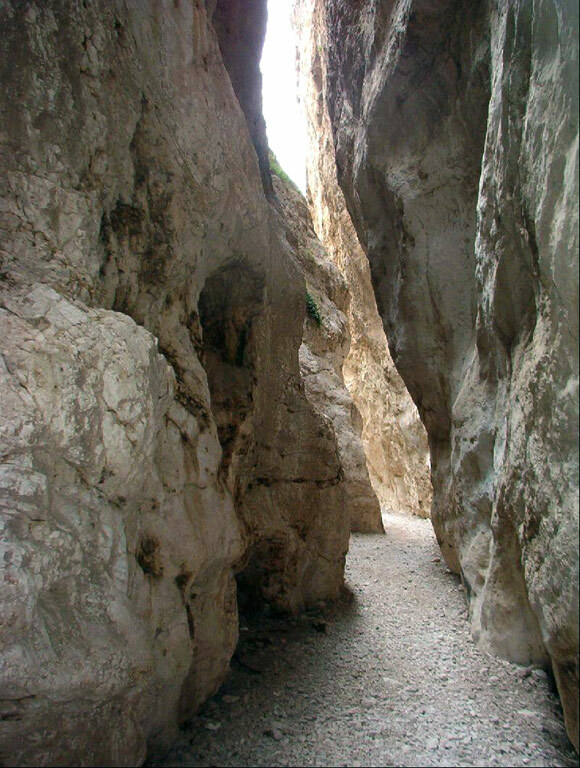 You walk to the upper end of Caramanico, and, after a short visit to the nature museum, you now walk right into the River Orfento canyon. Although the landscape is spectacular and wild, the walk is not difficult (and there are several walking options available). You’ll descend towards the river and then follow it all the way down through its narrow gorge. 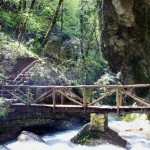 At the end of the canyon you walk through a surreal landscape of waterfalls and grottos. You have a nice picnic lunch somewhere along the river, before returning to the village of Caramanico. 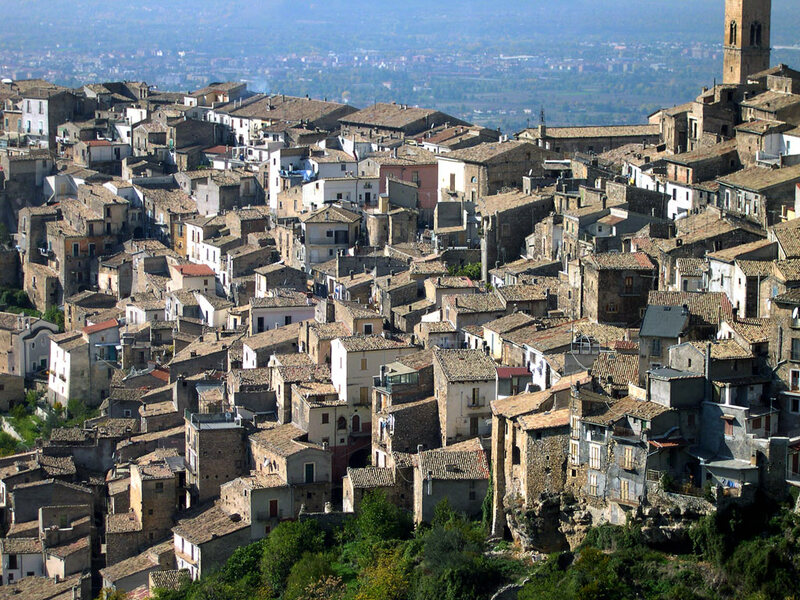 You then climb up to the old town of Caramanico and take a stroll through the historic town centre, beautifully located on the ridge above the river. The rest of the afternoon you are free to go for a stroll or have a drink. In the evening you have dinner together again. Total walking time: around 3,5 hours (approx. walking distance: 8 km). Your bus picks you up from the hotel and a scenic ride brings you to the tiny village of Decontra, where you start walking through an open landscape, dotted with several ‘tholos’, strange stone buildings that appear pre-historic, but were actually used by shepherds until just a few decades ago. 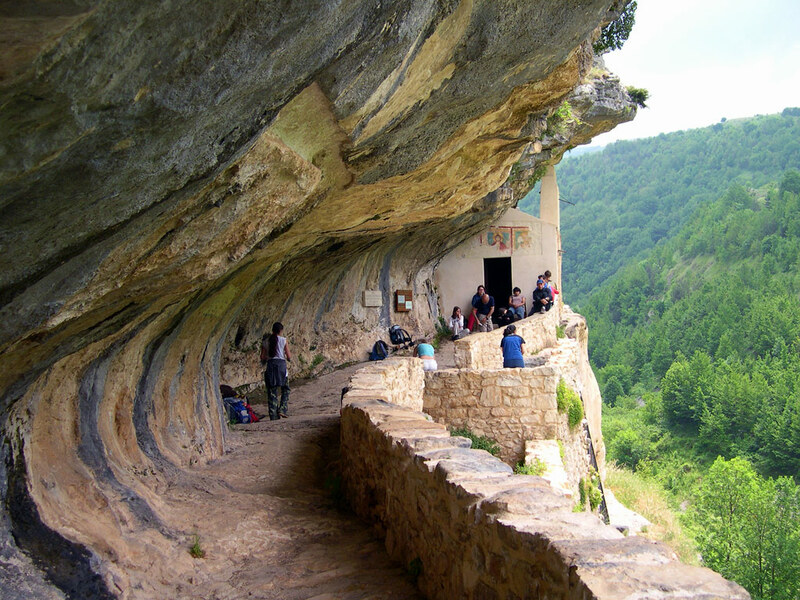 You descend into the canyon of Santo Spirito, where you’ll visit the beautifully located monastery of St. Bartholomew, one of the most scenic little churches in the region. This is a good place for a first biscuit stop. From here you climb up again and walk to the Convent of Santo Spirito. The bus picks you up again and brings you to a beautiful place for lunch. 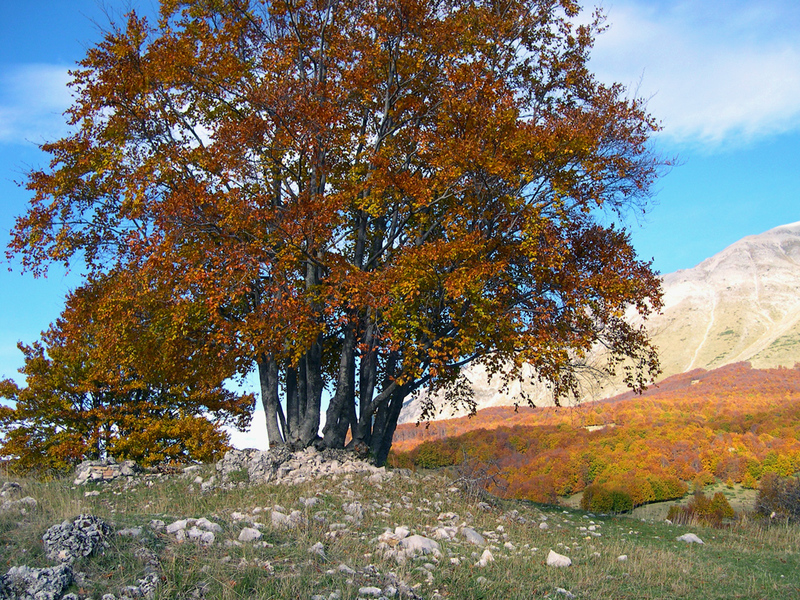 Then you travel on to yet another national park, the Gran Sasso, literally ‘big stone’. 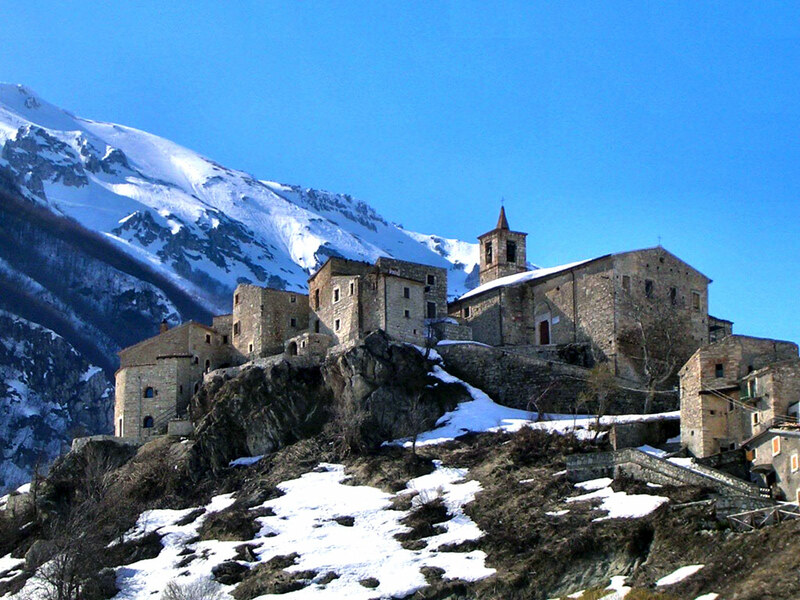 You are dropped off at one of the most scenic medieval castles in the region, in Roccacalascio, Italy’s highest village. You take some time to wander around this scenic village, now mostly abandoned. 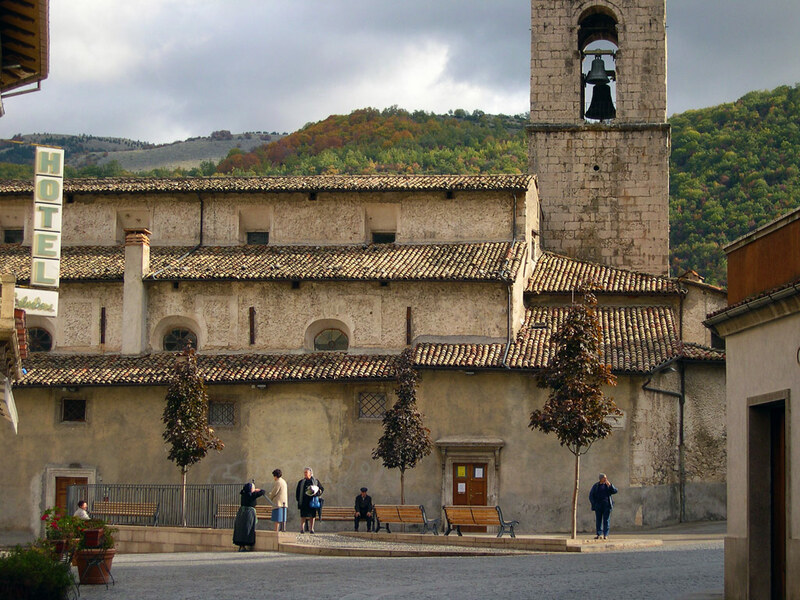 Then you walk along one of the most scenic footpaths in Italy towards the great renaissance church of Santa Maria, and from there on to the beautiful village of Santo Stefano di Sessanio, once abandoned and now carefully restored. Here you’ll spend the next two nights. There is time to enjoy a drink beside the lake, before going for dinner in the traditional inn next to the hotel. Total walking: approx. 3,5 (5) hours (approx. walking distance: 9 (14) km). Total driving time today is around 2 hours. 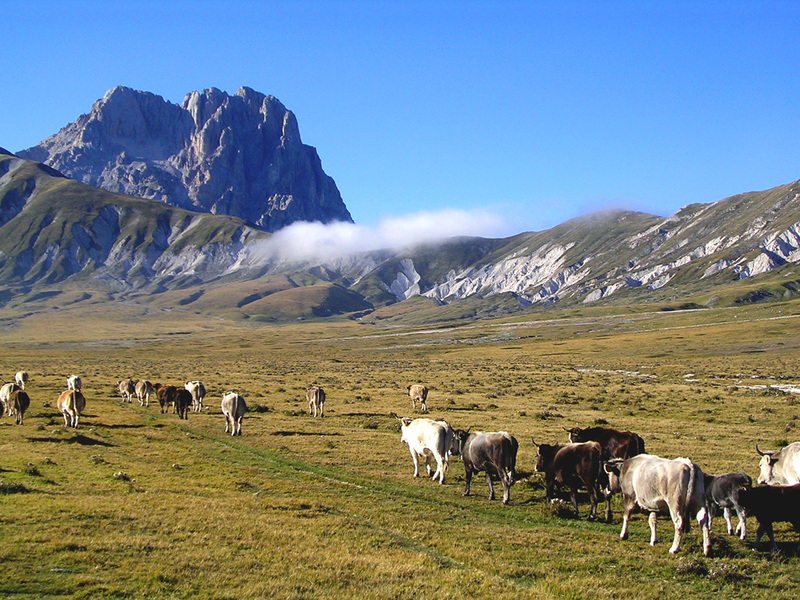 After breakfast you make a short drive to central Italy’s highest mountain range, the Gran Sasso, now protected with national park status. 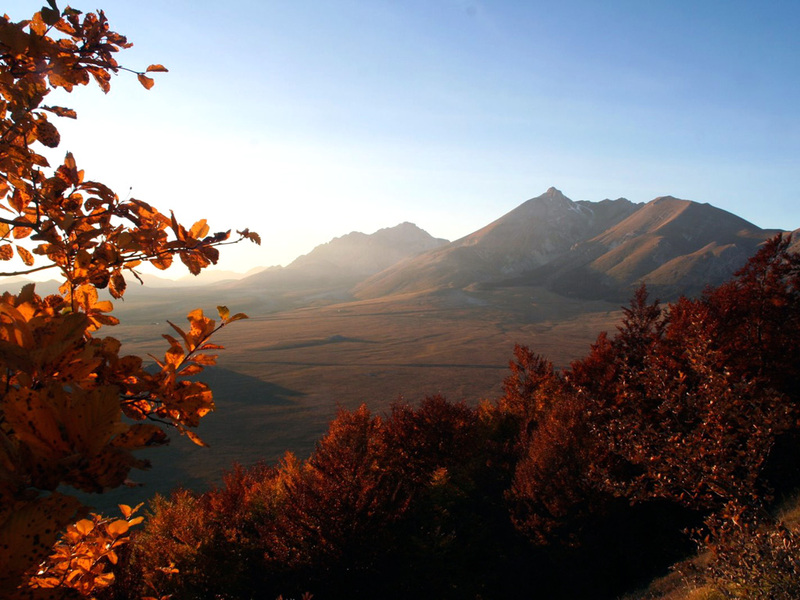 You arrive at the foot of the mountains on the plateau known as ‘Campo Imperatore’ (the Field of the Emperor). 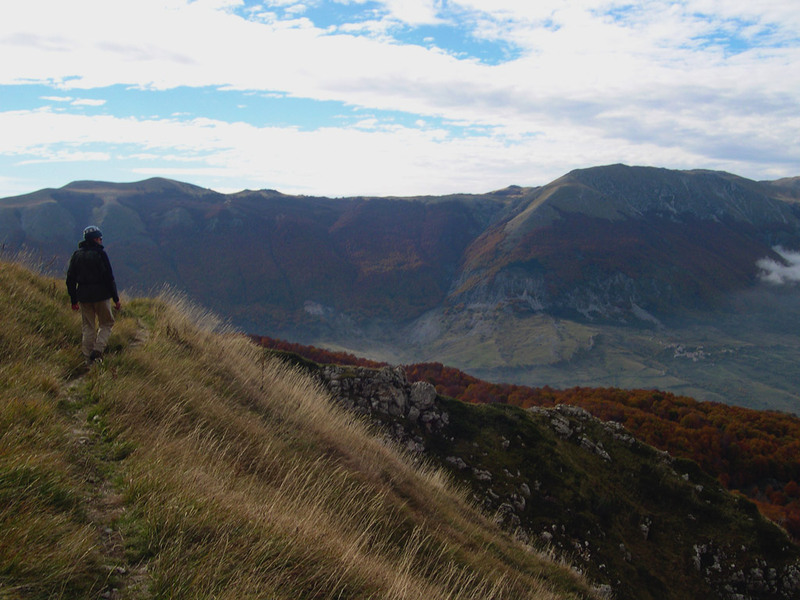 Here, depending on the weather conditions, you have several options for a beautiful walk. 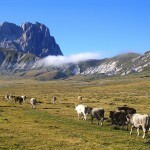 You can opt to follow the ridge towards the highest peak, Corno Grande (2912m), or opt for a roundwalk along the vast high plain of Campo Imperatore. You have a nice scenic picnic lunch in the mountains and then walk back to the plain of Campo Imperatore, where your bus is waiting. 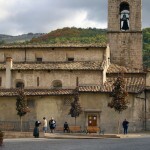 Perhaps after a drink, you travel back along a wonderful scenic road to the beautiful village of Santo Stefano. Those who feel like it can also opt to walk all the way back to the hotel. Time to refresh and then choose where to go for a hearty meal with local specialties. You are free to make your own dinner arrangements tonight. Total walking: approx. 4 – 5 hours (approx. walking distance: 8/10 km). Total driving time today is around 1.5 hours. 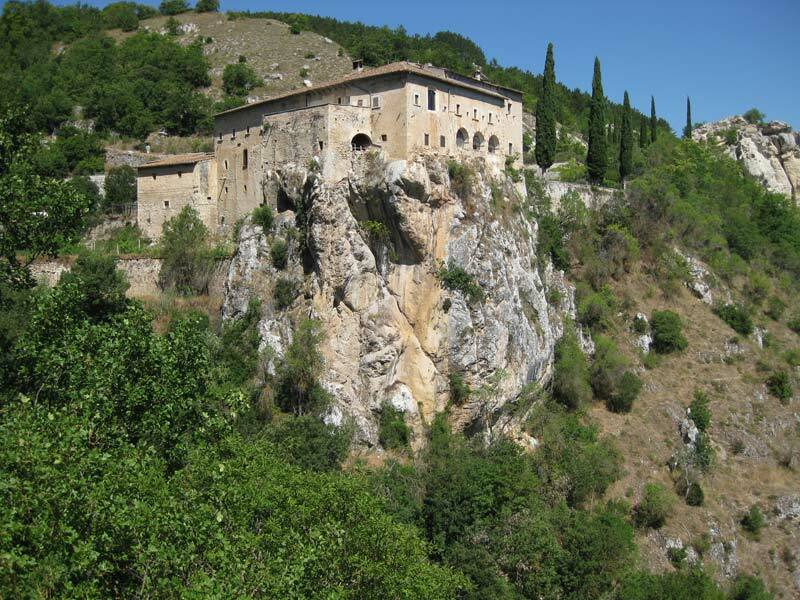 Following a leisurely breakfast, you travel by private minibus to Anversa degli Abruzzi, another nice medieval town dominating the spectacular canyon of the Sagittario River. Here you have a short break and buy some picnic supplies, before your bus brings you up to the hamlet of Castrovalva, nestled on the ridge like an eagle’s nest. From here you make a beautiful walk, first along the ridge through a nice open landscape of mountain meadows and forest, with spectacular views over the canyon. 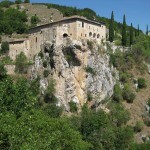 The walk leads you to the abandoned village of Frattura Vecchia (‘old Frattura’), a very scenic spot, and continues to the charming little village of Frattura (Nuovo), with marvellous views of Lake Scanno. 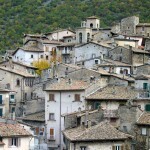 From here you either walk down or take the local bus down into the valley, to the village of Scanno. 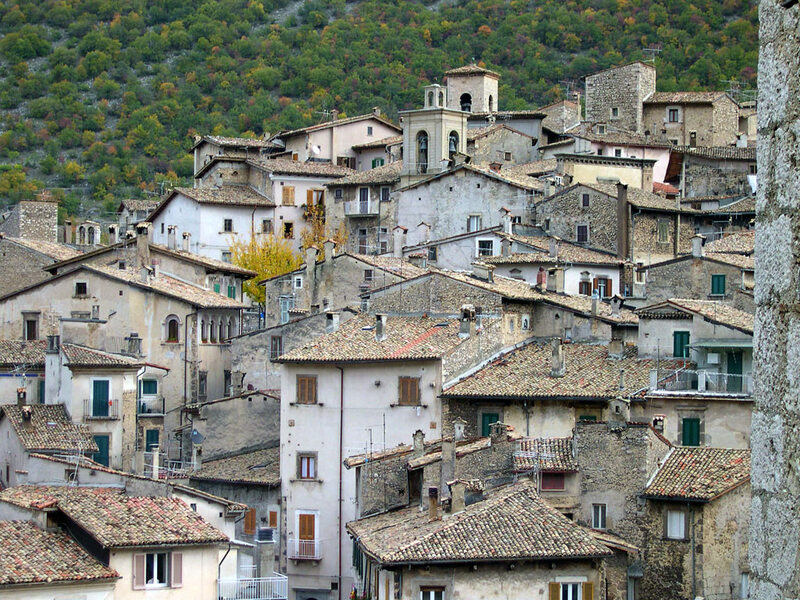 You have time to explore the historical heart of this village, maybe the most picturesque in the Abruzzo range, famous for the women’s traditional dresses, immortalised by the photographer Cartier-Bresson back in the 1950s. 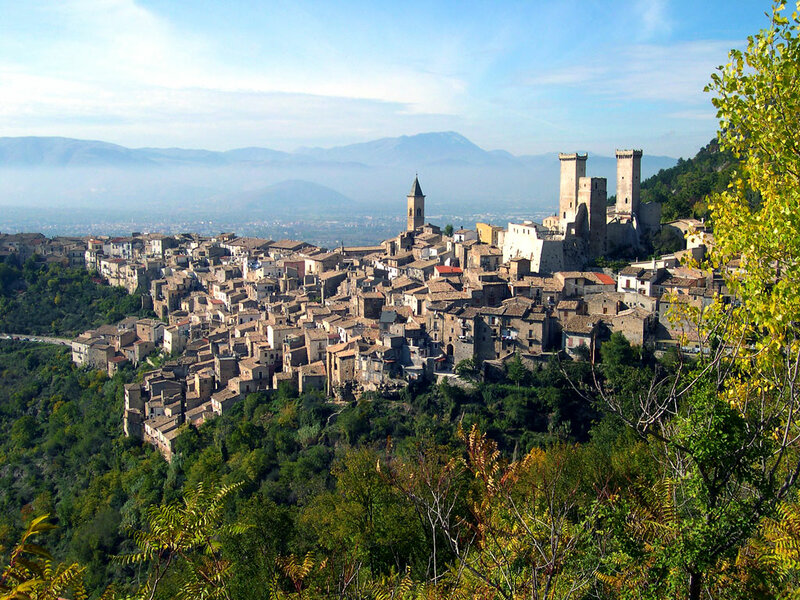 After a short stroll through its characteristic streets, and maybe a drink, you continue a scenic drive to Civitella Alfedena, where you settle in at the hotel in the town centre. You have dinner in the hotel tonight. Total walking time: around 4 (5,5) hours (approx. walking distance: 9 – 15 km. 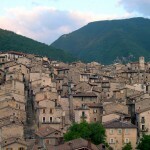 (Scanno). Total driving time today is around 1 hour. 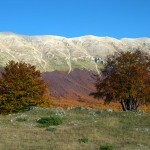 After a nice breakfast, you have several options for exploring the Abruzzo National Park. A number of wonderful roundwalks can be made here, ranging from easier to more difficult. 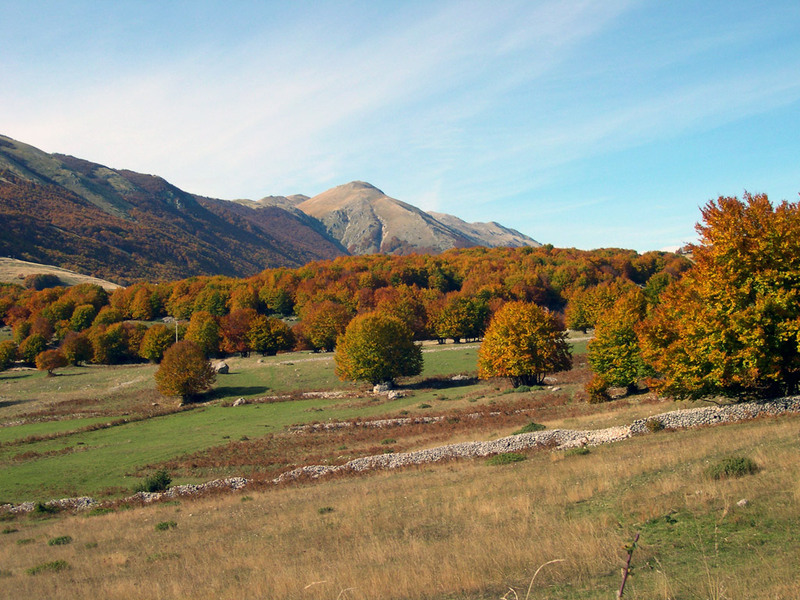 A good option could be one of the most famous trails in the National Park, the Camosciara, where it’s possible to see chamois wandering freely, or alternatively, the Val di Rose walk, which starts directly from Civitella. 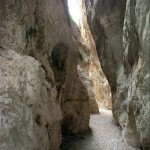 The serious hikers can opt for a challenging roundwalk to Monte Greco. If instead you want to relax you can opt for an easy walk along the lakeside and a visit to a museum dedicated to the wolf, an animal which still populates the mountains of this area. In the evening you go out for your last great meal together. After breakfast this morning, your trip ends. 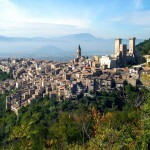 From Civitella you transfer back to Rome by private bus. 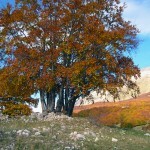 Those who want to extend their stay can either book some extra days in the Abruzzo National Park, in Sulmona, or in Rome. All nights are spent in beautiful, characteristic hotels, mostly historical buildings (generally 3-star; 4-star on some departure dates). All rooms have en-suite facilities. Accommodation is mainly on a half-board basis. Most evening meals are included, for which we have selected the best available restaurants. On two nights you are free to choose from the wide choice of restaurants in the area. Your guide can give you good tips for these evening dinners. Almost all (picnic) lunches are included in the tour price. On other days you are free to have your own lunch. Here you have the option of having your lunch in a nice restaurant, or purchasing your supplies for a picnic lunch. Night 1: The first night is spent in beautiful Sulmona. Your accommodation is a good 3-star hotel in the heart of the historical centre. Night 2 & 3:. These two nights are spent in a good 3-star hotel, located in the centre of Caramanico Terme, a spa resort in the heart of the Maiella Mountains. 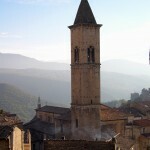 Night 4 & 5: These two nights are spent in the beautifully restored village of Santo Stefano di Sessania. Your accommodation is a good 3-star hotel on the lakeside, at walking distance from the historical centre. 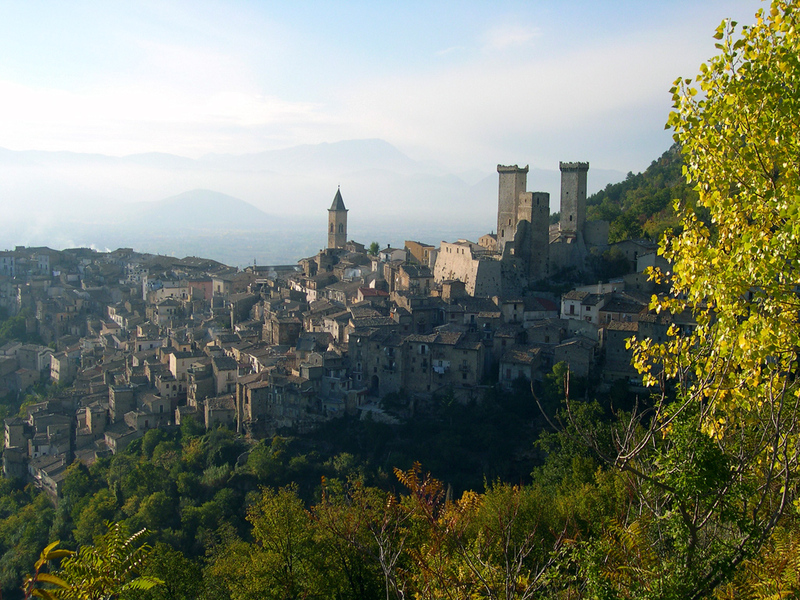 Nights 6 & 7: These last two nights are spent in a charming 3-star hotel in the pretty little village of Civitella Alfedena, renowned for its abundant nature & wildlife. N.B. On request we can run an upgraded version of this tour, staying in luxurious 4- and 5-star hotels. Arrival: The tour starts in ROME (Centre/Train Station) from where we travel by private shuttle to SULMONA. From Rome airport there are regular shuttle buses to the train station. Departure:The tour ends after breakfast on day 8 in OPI. A private transfer brings you from here back to ROME (included), from where you can easily continue your travels. In case you do not need to return to Rome, several taxi services are available to bring you directly to your next destination. N.B. For this tour tailor-made private departures (for groups of minimum 4 persons) can be planned on any date. Availability & prices on request. Prices start from 1390 euro p.p., depending on the season, choice of hotels (upgrades possible) and number of persons in your private group. NEWS: On request we can run a very special upgraded version of this tour, staying mostly in luxurious 4- and 5-star ‘wellness’ hotels. Information on request. It is possible to include some extra nights before or after your tour, in any of the accommodations ‘en route’. For those who have never been to Rome an extra day here is strongly recommended. 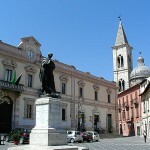 The tour can also be started from Pescara (airport) and easily be extended with a few days in Sulmona. At the beginning or the end of the tour there is the opportunity to visit Rome. The tour can also easily be extended with a few days here. Several good accommodations are available. Details and prices on request. Many of these tours can be turned into Private ‘Bespoke Adventures‘ to accommodate private group travel. We can organise both “off the shelf” itineraries, as well as create custom itineraries to meet your special needs. Book the dates you want, with the family or friends you wish to bring along! Longer and shorter versions of this tour are also available. Prices on request.